I had a descreet conversation with someone today about the whole situation and I feel reassured. God is indeed good. I still feel like I am being ignored, but then I have been a bit quiet too. Oh well. On another note, happier note, I have been having a lot of fun with Spotify in recent days. It has given me the chance to listen a whole bunch of music that I do not own (any more) for free and legally too! I am listening to Soweto Kinch as I write ... another CD in the offing!!! 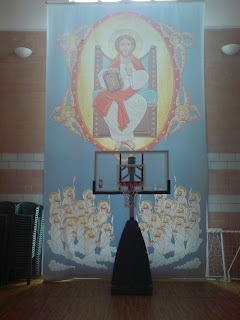 It comes from a study day that I went on at the Orthodox Centre in Stevenage. The basketball court is part of the complex. The icon is the same one that features behind the altar in church itself. It is sure one way of scaring the opposition! Other highlights that day were seeing the most beautiful and yet simple Basptistry, and the place where the knuckle of St George is kept and venerated... poor chap! So what lies ahead? Tomorrow - toddlers, a challenging pastoral meeting at lunchtime. No collective worship tomorrow having led it on Monday. Sermon prep to try to complete in the evening. So that's me tonight. Feeling more realistic. More chilled. At peace - shalom - knowing that God is in charge.